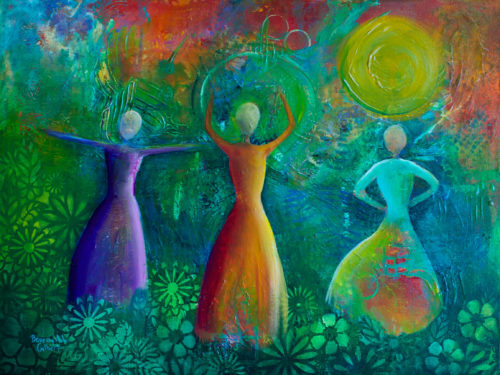 Women have been gathering at SomaSpace in a sacred, safe circle. They have been showing up unsure of what to expect, just knowing they feel a yearning in their hearts to sit with other women. And what has unfolded time-and-again has been awe-inspiring. Women are sharing their raw inner truths – both dark and light. They have spoken words aloud that have never been uttered to a group. Moved by the depth of empathy, presence, and power in the circle, women have bared their heartaches and declared their strengths. Some women just sit in quiet witness, while others share their healing powers, and yet others cry out for the struggles they are immersed in. Each night, words are spoken that are balm to our souls, inspiration to our hearts, and support to our weary selves wading through an unknown landscape. Each circle is unique. The energy of who shows up and how our paths intermingle guides our way. And each evening, we leave transformed – the glitter of the nights unfolding shining a light forward. Come sit in circle with the powerful women of Portland. Share a piece of your story, express the wisdom that sparks in you as you hear other women’s tales, and feel the solidarity and empathy of like-hearted sisters. Now is the time to come together! Standing Rock Fundraiser ~ Thank you!